Are you ready to for New Year’s resolutions? You may be working on developing your list… lose weight, get a gym membership, make your business more profitable. While we (alas!) can’t help with the first two, we can help with the third. Believe it or not, creating a list of 1,300 negative keywords could be a lot easier than losing that weight. 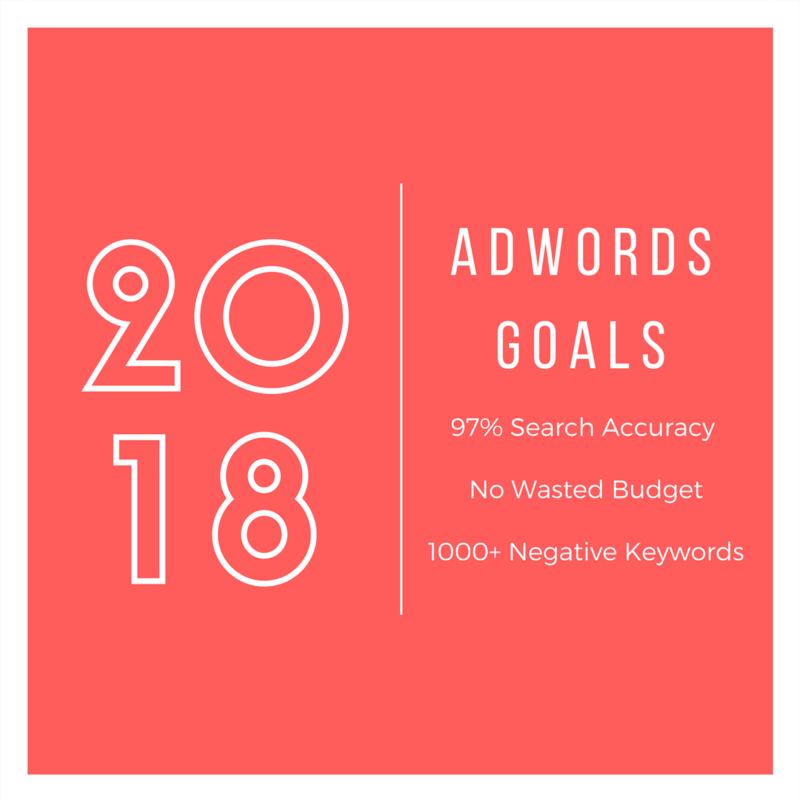 If you’ve been around us long, you know that we talk about negative keywords a lot – the idea of blocking the types of search terms that you never want to advertise on. Every wasted ad click is wasted budget – so whether your cost per click is $10 or $500, every wasted click can feel like a gut punch. We don’t want to see moving companies losing their budget because they targeted the word “moving” and showed up on “moving on lyrics after a breakup”. That hurts. We average 97% search term accuracy for our clients. We see it happen with our clients time and time again. That’s why we care about negative keywords so much. For us, negative keywords aren’t just a nice theory. We practice what we preach. We have developed a list of negative keywords over 1,300 negatives long! When we say we LOVE negative keywords, we mean it. And we think you should too. We want you to succeed. So let’s get real: how do you go about generating a strong list of negative keywords for your industry? Here’s a key tip: think about categories of keywords that you would like to block, and then brainstorm as many keywords as you can think of for that category. What kinds of categories are we talking about? Here’s one example: if you own a business and are trying to advertise for your business, you don’t want to be showing up on searches from other business owners and advertisers in your industry. So, for instance, if you are a law firm, and you advertise on the word “law firm”, you could be eligible to show up on “advertise a law firm”, “creating a law firm”, or “how to start a law firm”. So you would want to brainstorm all the ways that someone could search for advertising advice for your particular business. Then, add those core terms, like “advertise”, “creating” and “how to start”, as negatives to your account. Another potential category would be people searching for jobs. If you are a moving company advertising for customers, not new employees, then you don’t want to be searching up on searches like “moving companies hiring near me” or “moving company jobs”. What about services you don’t offer? These types of keywords are a common pitfall for business owners on AdWords. If you offer moving, but not storage, and you target the word “moving”, then you will show up on a lot of “moving and storage” keywords, people who are looking for moving companies that have storage. As soon as they discover that your website doesn’t offer storage, they bounce from your site, after you spent the money to get them there. Add every service in your industry that you don’t offer as a negative to avoid those types of searches. You can also block the names of your competitors. Here at Rothman PPC, our experience is that competitor searches generally lead to more bounced website clicks than conversions, especially for businesses in service industries such as moving and plumbing. One way to find all your local competitors is to search for “local XXXX near me”, for instance, “local electricians near me”, and then create a list of all of your local competitors that Google shows and block those names. These are the types of strategies we recommend for building a strong negative keyword list, improving your search traffic, and ultimately improving the profitability of your business. Say goodbye to wasted budget, and say hello to quality search terms.